The quick answer is that I started using a Surefire Minimus. The longer answer is why. Generally, I look after my belongings, outdoor kit or otherwise. My critics might say not to be so precious, “it’s only stuff”. But I’ve always been careful to look after things. Fundamentally, I hate breaking things. I like material possessions to last as long as possible. It is less about frugality and more about reliability. This is particularly the case when it comes to outdoor equipment. I have moderately high expectations of outdoor equipment. I expect that it will be reliable under regular and continuous use, under various conditions over the course of various seasons, for at least a year. Let’s face it, there is a lot of cheap rubbish out there. Most people who enjoy outdoor life are limited by their holidays/vacations as to how many weeks or even days per year they spend pursuing their outdoor leisure pursuits. This allows some outdoor equipment manufacturers to sell equipment that doesn’t last very long. For the average outdoor user, it takes a while to wear out gear, because infrequent use is spread out over an extended period. My first decent quality outdoors lamp was a Mini Maglite. This was great for the time (1991). Solidly built, reliable. The warm glow of its single bulb was comfortingly homely but it wasn’t very bright. I also became a little tired of dribbling spit on myself, and sometime even gagging, while holding it in my mouth to keep both hands free, particularly when packing/unpacking my rucksack, preparing food, operating stoves, etc., in the dark. A Nite Ize headstrap eventually solved the latter problem but not the former. The advent of LED headtorches quickly supplanted by liking of the Mini Maglite. I bought a Petzl Tikka. It was a revelation. Lightweight, comfortable and powerfully bright in comparison to old bulb torches. The first one I had lasted a reasonable time. I don’t recall exactly but it was over a year. It did eventually disintegrate, however. 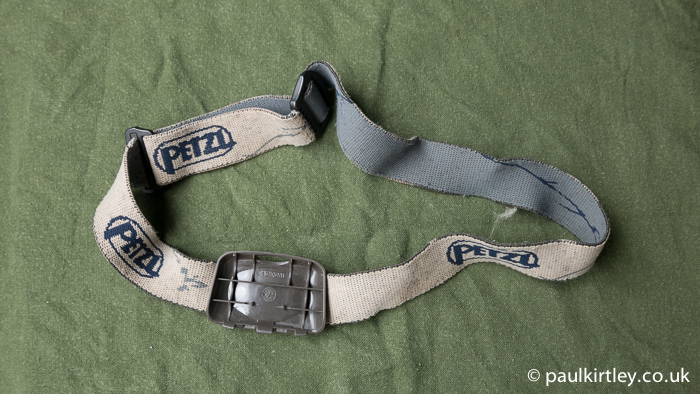 All that remains of it in my box of Petzl bits is the strap and backplate. Next I bought a TakTikka. 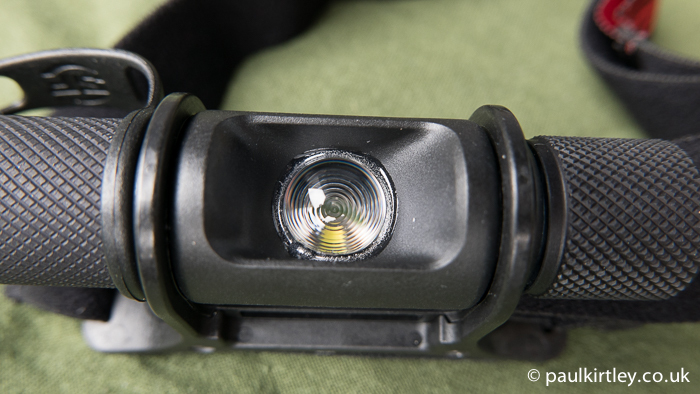 This Petzl headlamp had a hinged red filter “for night use”. Great for night navigation, I thought. Apart from the fact that Ordnance Survey maps have contours shown in brown and are very, very hard to see in red light. But that wasn’t the main issue with the TakTikka headlamp. The plastic body cracked due to some mysterious rucksack event. It went into my bag whole. It came out cracked, seemingly due to my having had the lid closed all day (the lamp was in the inside mesh pocket of the rucksack lid – my standard place for stowing my headlamp). It still works but only if you squeeze the crack closed, which in turn puts enough pressure on the battery contacts. I blamed myself for carelessness and bought another TakTikka. This time in black. It had a new, improved rubberised pushbutton switch, which was almost impossible to find, let alone successfully depress whilst wearing gloves. Despite the shortcomings of the improvements, this lamp lasted a reasonable while – at least a year and a half. Maybe more, actually. What happened in the end was that I went to put the torch on my head one Winter evening in the woods but the head strap did’t grip my cranium. The immediate solution was to tie an overhand knot in the head band so it would sit on my head. The elastic of the headband disintegrated, so I tied a knot in the band to hold it on my head. Photo: Paul Kirtley. So, I had bought a Petzl Myo XP for serious winter use, where night navigation was more likely and more critical. This was used for winter walking in the UK as well as in northern Sweden. It had a bright beam, which was more directional than the Tikkas. If you needed something more diffuse, then there was a diffuser on the front, which could be flipped up. The downside of this was it still used as much battery power as throwing the beam a good distance. 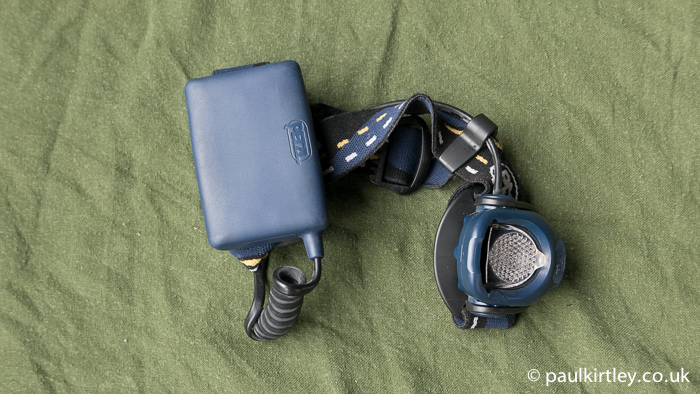 There was, however, the extra power of an external battery pack, which sat on the back of the head strap. This made the lamp feel balanced on the head, rather than heavy. After using the Myo in the winter, I liked its utility more than the Tikka so, despite the extra weight, I started taking it for more regular use in the UK. The next winter I was working in Sweden again for a couple of weeks in February, so I took the Myo. The lamp was fine when I arrived but the next evening I took the lamp out of my pack and I noticed the battery pack was very hot. The lamp would not turn on. It seemed the unit had somehow shorted out the batteries. On putting in fresh batteries, the same happened. This resulted in me having to borrow cheap LED headlamp made of cheap plastic, with a flimsy bracket (the sort sold on special offer in roadside service stations). Somewhat ironically, this “crappy” headlamp actually worked flawlessly for the rest of the 2-week trip. It hadn’t been really bright enough though and I had been concerned that I would break the flimsy bracket or housing. I’d had enough. I thought there must be a more robust, reliable, high performance headlamp solution than the ones I’d been using to date. The Myo had me sold on the idea of a more powerful LED headlamp with an external battery pack. It’s just the Myo failed to live up to the idea. Well, it just failed. I liked the idea of being able to have increased power over and above what the space constraints of internal batteries allowed. I liked the balance provided by lamp at the front and battery pack at the back. I wanted something more robust than the plastic Petzl headlamps though. My other bugbear with Petzl torches was that all but one of them I had owned specifically stated that lithium batteries should not be used with them. The one exception I had come across was the eLite, which I carried in my first aid pouch. Lithium batteries have a couple of advantages for wilderness use – they are lighter in weight than alkaline batteries, much longer lasting and they also work better in cold conditions. So, I was looking for a robust, powerful, headtorch, which could be run on lithium batteries. I found it in the form of the Surefire Saint. 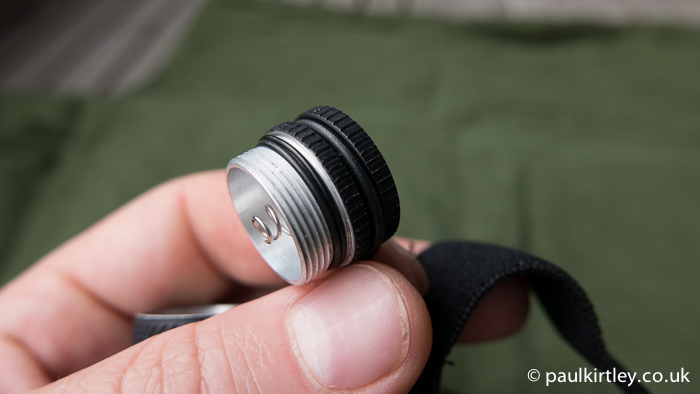 The robust LED and lens unit of the Surefire Saint/Saint Minimus. Photo: Paul Kirtley. This is a model of head torch with an external battery pack which plugs into what used to be called the Surefire Saint Minimus. This standalone headlamp is now known as the Minimus. 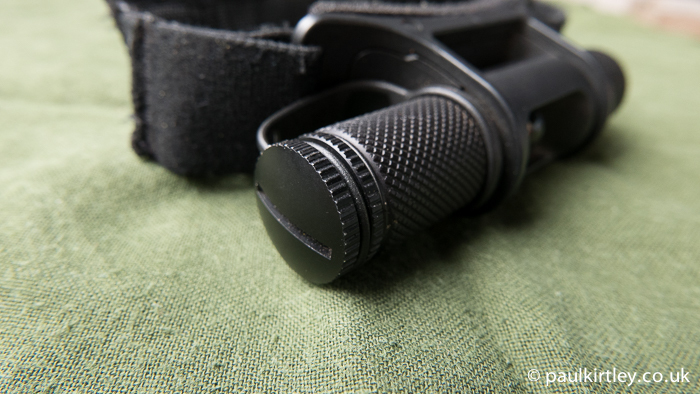 I was a fan of Surefire torches in general, being a user or their E2L and E1L Outdoorsman flashlights. The standalone Saint unit runs on one CR123 lithium battery. This is a common camera battery and relatively easy to get hold of in developed countries. I liked the flexibility of this approach. A smaller, lighter minimal unit for when size and weight needed to be optimised with the option of creating a larger unit with external battery pack for darker, colder trips, where more longevity was needed. Moreover, through some well-thought-out design, the external battery pack takes both CR123 (three of them arranged vertically) or AA batteries (two arranged horizontally). This gives the traveller maximum flexibility in obtaining batteries, AA batteries being one of the most common battery sizes worldwide. 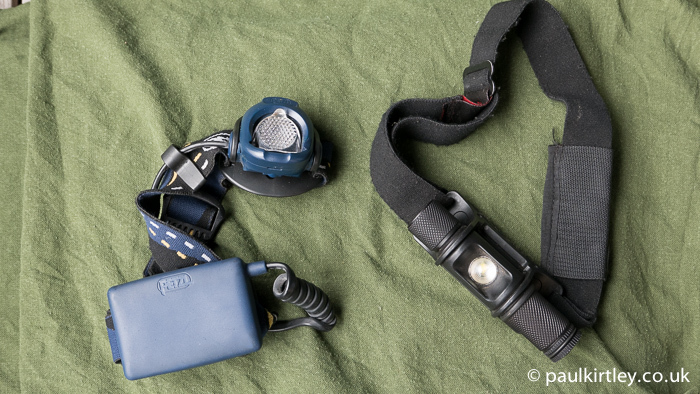 Petzl Myo XP with the Surefire lamp which replaced it. Photo: Paul Kirtley. Unfortunately the model with external battery pack is no longer available. But, frankly, I have come to use the stripped down model most of the time anyway. Other features I like are that is bright. Very bright. Unlike other torches, however, the brightness is almost infinitely adjustable due to a neat rotating barrel control, which smoothly takes the lamp from a barely on power of 1 lumen through to full 100 lumens. Many other headlamps have only a low/high setting or maybe a low, medium and high setting. This means with the Saint, I can choose the exact brightness that suits for everything from reading in my sleeping bag at the end of the day through to cooking to working with tools to finding my way through a pitch black woodland with a powerful beam. This makes efficient use of the battery and is comfortable on the eye. By contrast, many headlamps are dazzling when used for reading or too diffuse for wayfinding. Almost infinitely adjustible brightness. Photo: Paul Kirtley. The main barrel of the map rotates in its mount so that you can set the beam at the exact angle that suits you. This arrangement is far superior to any flimsy plastic bracket arrangement. I love the flexibility of this lamp and have been using it for 5 years with no trouble. The barrel of the lamp rotates in the main bracket of the unit to provide the angle you want. You can see the solid build quality here. Photo: Paul Kirtley. The current model comes with a clip-on red filter and has a setting for a long-running flashing SOS signal. The Minimus has a tough aluminium body, rubber seals on the battery compartment. Other parts are made of a tough polymer. Mine has been 100% reliable from hot summer evenings to the depths of winter in the boreal forest. It has been subjected to snow, rain, canoe capsizes (the manufacturer states the lamp is submersible to 3 feet for up to 3 minutes), long hikes in the mountains, weeks in the woods and it is unaffected. The Surefire Minimus takes a single CR123 lithium battery. Photo: Paul Kirtley. The end cap of the battery compartment is indicative of the build quality and includes a rubber seal to exclude water from the unit. Photo: Paul Kirtley. Colleagues and regular clients have bought this lamp as they have seen how mine has performed on courses and trips. Recently, on my recommendation, another friend bought a new Minimus and I thought it was about time I wrote about my experience with this lamp. It was also a good opportunity to look at the wear and tear inflicted by 5 years of heavy use, which you can see in the photographs below. 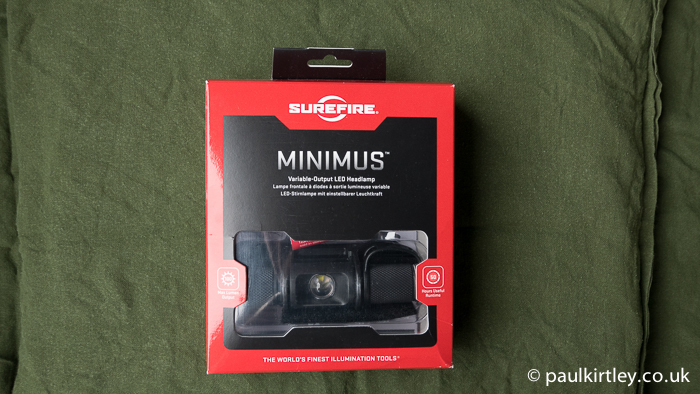 New, boxed Surefire Minimus. Photo: Paul Kirtley. The brand new Surefire Minimus. Photo: Paul Kirtley. 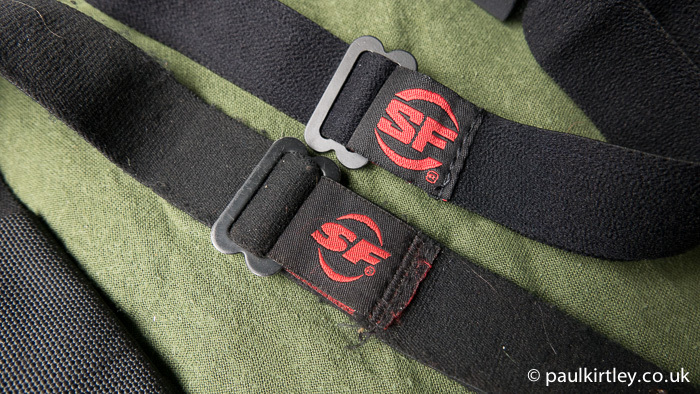 New headstrap fittings by comparison. Photo: Paul Kirtley. Yes. Despite what I’ve said above about Petzl lamps, I do still recommend them. 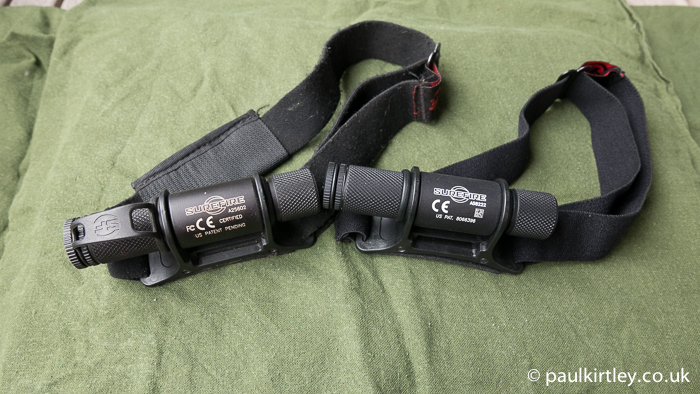 I recommend whatever is the current model of Petzl Tikka to people who don’t have a huge budget for a headlamp but want one that will be bright and will most probably work for a single camping trip or a week in the woods on one of our courses at Frontier Bushcraft. Also, the current version of the Tikka weighs 84g. That’s hard to beat when low weight is most important parameter. 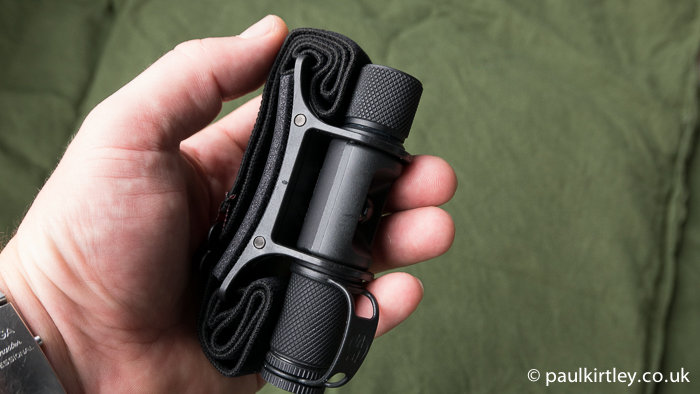 If you want a headlamp that will reliably last multiple trips or months in the woods, and you don’t mind it weighing 60g more than the Tikka, then I recommend the Surefire Minimus. This clearly reflects my choice. This is based partly on the desire for 100% reliability in my wilderness equipment, partly on economics. Three or four Petzl Tikka XPs will pay for a Surefire Minimus. 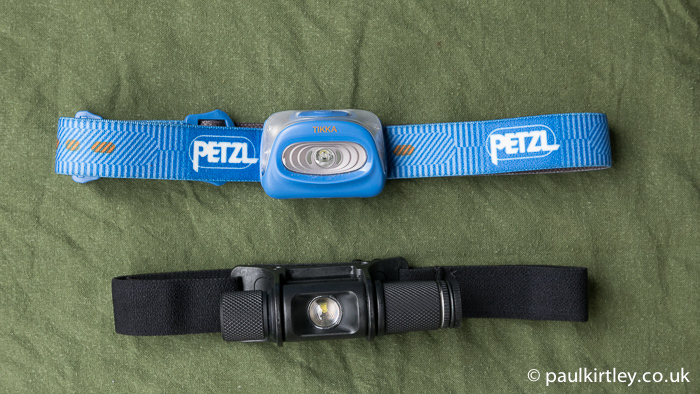 The current Petzl Tikka (top) with the current Surefire Minimus (below). You pays your money and makes your choice. Photo: Paul Kirtley. Let me know in the comments below about your experience with the durability of your headlamps. Be honest about longevity though. If you’ve used the lamp for one week of camping last year and one week of camping this year, then by my metric, so far it’s lasted a couple of weeks, not a couple of years. 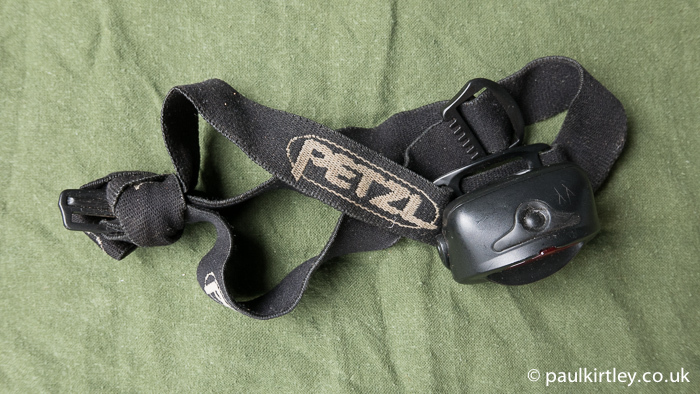 I’ve had several petzl headlamps over the years and broken several. At the moment I’m using the petzl model that a lot of soldiers use, I forget which model it is now but I’ve never had any problems with it. It has an interchangeable red filter and diffuser, I use the diffuser a lot around camp. I also have an e-lite that I keep in my first aid kit. Until a couple of years ago I coupled my petzl with an Led lenser P7 so I had a torch that was a lot brighter with a beam that I could adjust the focus, I still use the led lenser occasionally but I won a zebralight torch in a competition and it is amazing, it has an adjustable brightness level that goes up to about 700 lumens, is very compact and lightweight and is robust, the only downside to it is Tha it only runs on 18650 rechargeable batteries whereas the petzl and led lenser both use AAA. Until my petzl headlamp gives up I’m happy with it and its been going strong for about 3 years now. I hear the petzl NAO is a very good torch. Don’t know how long I’ve had my Petzl Tikka XP for – probably about three or four years, going away every second or third weekend, camping and staying in bothies, walking and cycling in after dark and occasionally finishing hills/routes after dark too. No breakages (touch wood) and still the original strap. That Minimus is a nice-looking piece of kit, biut not sure about the extra weight on the front of my head. A pal gave me another headtorch with a good strong beam which looked to be much better for cycling, but it was front-heavy and kept jiggling about with every bump in the track. You’ve had back luck with Petzl. I’ve been using a Tikka XP since 2009 and it’s still working fine. It’s been on two multi-month walks and loads of other trips. I have an original Myo too, which I sometimes use in winter. Not sure how much use it’s hard bit it’s a fair bit though nothing like the Tikka XP. 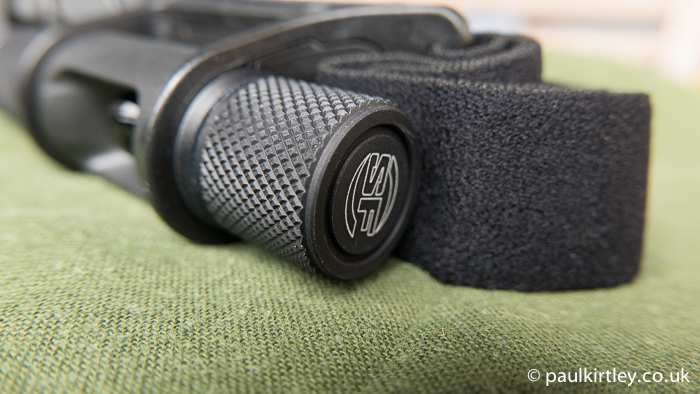 I have had failures with other brands of headlamp – and they’ve only had a fraction of the use of Tikka XP. It’s been interesting to read other people’s comments here, including yours. There is varying experience with Petzls and it does seem I’ve been unlucky compared to some but by no means alone in my experiences. That said, one model which seems to come out favourably is the one you mention here – the Tikka XP. I might have to investigate this model for the lightest weight of outfits. Another great headlamp I’ve been using for a couple of years are those made by a company called Coast. Their HL7 is affordable, reliable, infinitely adjustable and is carried at most hardware/ home-improvement stores. They’re made for contractors so using them with gloves has been easier than any other headlamp I’ve used. They’re only downside, if you turn the brightness up all the way, they can eat through batteries. But with care, this has yet to be a real issue on any hike or climb I’ve been on. Oh, and they’re made in Portland, Oregon and have a lifetime warranty. Check them out. I have the second Petzl TakTikka, the black one with the red lens that flips down. I’ve had it for about ten years now, but only really used it for perhaps a year and a half worth of real use. I’ve not had any problems with it, and prefer it to newer versions of headlamps with multiple buttons and control functions which get too complicated for me to remember when using them. It’s lightweight and gives reasonable illumination. The Surefire looks great, but probably a little out of my budget at the moment. I’ve used the same Taktikka (with the camo headband) for over a year in the army (daily use of the lamp, except in the weekends, off to the bar!). It got submersed in water, mud and got a beating of the other kit we where wearing in our smocks. It still works up to this day (bought it 7 years ago) and is used as a back-up light for on the job. Think you just had some bad luck, same with cars. The great thing about the older Petzls was the assuring click when activating them, I hate the soft press-button that you, indeed, can’t find while wearing gloves. But now I’ve bought it, I might better use it until its broken or wants to retire. I do like the lamp you are using, might give it another look next time we meet. Like you, I have a collection of ex Petzl headtorches, but my current model, a Nao Reactive is absolutely brilliant and has been going strong for a couple of years. More expensive than the basic models, but really well made and I can’t see anything breaking in foreseeable future. Thanks for the article. I’ve been a bit of an explorer for the best headlamp for my use kind of use for a while now. I use mine mainly for hiking. Yes the Made in China headlamps are very good now. That includes Surefire and others including Nitecore (my personal favourite). They are often machined out of solid aircraft grade AL. I wouldn’t go into the features but I think you’ll be famailar with them. Zebralight is another hot favourite of mine. They resemble the old L torches but are much much smaller. You couldn’t damage them even if you dropped them on the ground and stomped on them. I too have a couple of deceased Petzls, but since getting an e+lite in ”09, it’s been my constant companion. I bought a second for the inevitable failure, but as yet the first is going strong. It lives in my first aid kit on day trips, or around my neck when in a long term camp. It has seen me right on night ascents of Snowden and Sca Fell Pike, and even the midnight start for summit day on Kilimanjaro. The review makes the Minimus very appealing, but I will have to wait at least until my first e+lite fails. So it could be a while ( tho’ that will let me start saving towards the £200 price tag). I totally agree with you,personally i would only use petzl as a back up bike light. I live in Sweden and i used to work as a newspaper delivery with a route of ca 5km for a year, if you are doing chores in weather that goes from Humid to zero you need a hedlamp you can trust and manouver with gloves on,i used to use a hunting style led,it lasted 8 month used 3-5 hours every night in mostly snow and rain. i had it with me when hiking in nort of sweden and it died.. i have found a diffrent solution though, Diving headlamps! Still cheap! guaranteed to work in pouring rain, rubber that withstands saltwater, you can turn it of and on with mittens, no fancypancy, just a workhorse! I also started with Petzl Tikka, but it broke near the opening button on the case (still usable) but later on the side. This was the end of a 8 year happy use. Now I am pleased with the Fenix HL10. My first Petzl took the 4.5v flat battery, not the easiest thing to buy so I bought the conversion to take the AA x 3 batteries. It used to “eat” AAs like there was no tomorrow. A very interesting read, and even more so in that it was from someone who probably uses headtorches a great deal more than many. I have been a long time user of Petzl headtorches, starting with the Petzl MYO, then MYO3 and more recently MYO RXP, similar to the MYO XP. I most certainly won’t have used my headtorches as much as you, but a lot more than a great many, for I’ll happily go night hiking to keep my nav skills nicely tweaked. I’ve had no problems with the straps on any of my headtorches, with the MYO being kept as my backup headtorch, until the Alpkit Gamma was purchased, should the main one fail. I can say that all the Petzl headtorches have performed satisfactorily and certainly the new owners of all my headtorches are reporting satisfactory use. They all know me, so I’d soon know if there was a problem. The MYO was replaced by the budget priced Alpkit Gamma, an adequate budget headtorch supporting my MYO RXP. The Led Lensor is in it’s very early stages of usage, mainly due to the fact that my right leg was severely mangled by a speeding motorist back in February, but I’m itching to get out and try the Led Lensor H14.2. My first impressions, it’s an impressive beam and flood, bettering the MYO RXP, but only down the nice and long back garden we have. I really need to get out on the hills and moors to really use it properly. Incidentally, I still have the Alpkit Gamma as my backup, that was purchased back in 2009, the strap is still good, it was used while doing my nav training in Snowdonia, and though it hasn’t suffered the perspiration or stretching that my Petzl’s had before they moved on to new homes. I’ll not criticise your findings, for that is what happened and I found it interesting to read someone else’s perspective and say thank you for sharing. Well Paul I don’t use headlamps because I am a little old fashioned. What I use is a cheap flashlight made in China and it even includes batteries. Also, it only costs a dollar at a dollar store. If I use a flashlight like this and I take care of it, it may last a couple of years. Or I use my floating battery operated flashlight if I need a good bright light to see by. At Walmart it only costs about three dollars and it includes batteries. Or I use my mini-Maglite which can be used as a small lantern if I need to work on something. And it even includes batteries. I learned the hard way in the military to only carry what I need on my back. With a little hindsight beforehand I know exactly what to carry if I know what the trip will be like. This is a very interesting post, thanks for sharing this. I have noticed that I often get leaking batteries in the Pezl Tikka models.. don’t know why but I have had leakage three or four times in the last two years, lost two lights. Question: Are you using the Minimus with rechargeable batteries? Aren’t CR123 batteries a lot more expensive? Currently I am using a very small Black Diamond ION light that works by swiping across the front. It is very bright, adjustable, lightweight and small with just two AAA batteries. Cost is only €25,-. Generally I like it but it won’t be robust enough to meet your criteria. Interesting regarding your battery leakages. This fits with my experience of the Myo XP. I’m using Lithium batteries with the Saint/Minimus. CR123 are not too expensive if you buy them in bulk online. If you buy them individually in the supermarket/general store, they are about 4x the price. I actually despise headlamps mostly because I find them very uncomfortable and a bit restrictive in their use. I have used a First Light USA Tomahawk for a few years and absolutely love it, I have a couple of different mounts allowing it to mount to most things and it is a torch I can have in my hand and still use my hands as well if that makes sense. Not cheap but so far it has been bombproof so if you liked the old angle torches but wanted something 21st century this is it. Interesting article as always. Your conclusions and recommendations I take very seriously, and if any of my headlights fail I’ll take a proper gander at the Minimus. It looks bomb-proof, which is arguably its best feature. In my ‘shave a gram or three off my carry’ phase years ago I bought a tiny plastic Petzl e+lite. It’s been up over 50 Munros (some in the winter), dropped in puddles (not by me!) and has never missed a beat. The elastic is tatty now but I’m delighted with it. Very light 😉 at 27g and a red light for night use, but at 26 lumens isn’t great for looking ahead whilst hiking – but good round camp. I now use it as a back-up, as for the last three years I have used a Black Diamond ReVolt. Much stronger beam, excellent battery life, either on recharge or AAAs, red light, flood/spot, and 130 lumens. Not too heavy and a great all-rounder for me. I’ve lived with it for weeks at a time and it’s never failed (even with James and Matt playing with it). Keep them coming, Paul, and best regards to you and your team. There are sure many good headlams out there. 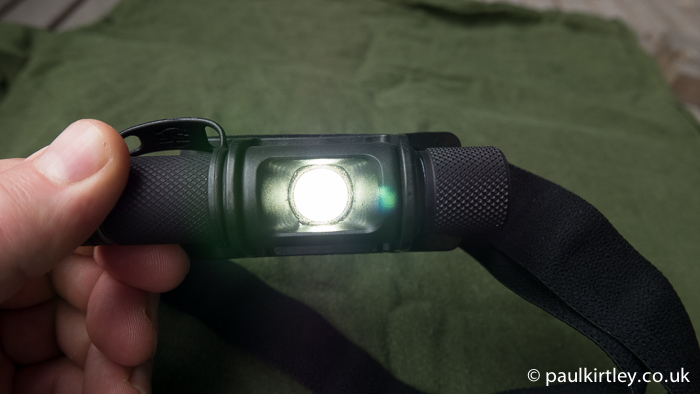 My last discovering, just in case someone doesn´t know: fenix HL10 Headlamp. May be not “bombproof” but you not always need that either. Small, only one small AAA battery, 3 modes and can become a tiny hand lamp. 200% recommended! 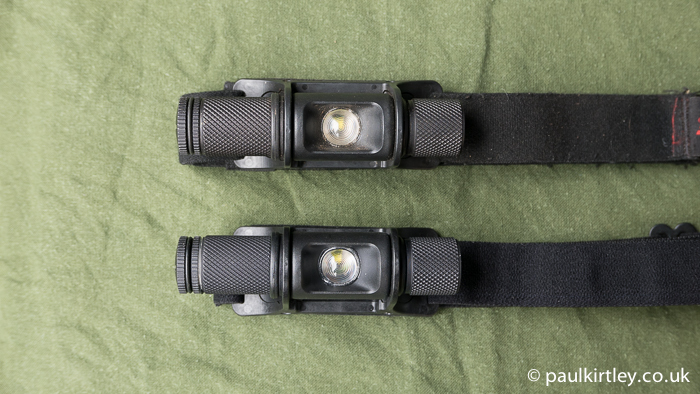 I’m not a HUGE fan of Petzl headlamps, but as you initially stated in this review, I’m one of those “weekend warrior” types who really only puts about 6 months hard-use into a piece of gear over say a 2 year period. So I can’t comment on successive hard-use day-in, day-out. I mean, if you were truly stuck in say, Alaska, or Boreal Canada, and visited a small town or had to “bug out” (the grid was down and trucks stopped delivering goods) and didn’t have access to CR123 batteries, (and yours you took with you were all dead), you have a much better chance of finding AA or AAA battery sizes than you would the CR123 format. Am I right? I’ll take my chances with a cheaper Petzl model (that MAY break sooner or later), but that still takes a much more universal source of power. Yes, I agree with you on the CR123 vs AA point. That’s why I like the external battery box which came with the original Surefire Saint model, which will take either battery model. Shame it is no longer available. Great article again Paul. As a regular night off-road hill runner (no tracks) I have used a few Petzel’s in the past. They are still going well, however I picked up the ‘LED Lenser H7R Rechargeable Head Lamp’ (used by many Mountain rescue teams) about 2 years ago. The reasons I like it over the Petzel’s are lighter weight, the included charger adapter and rechargeable batteries that let you charge it without taking covers off, but mostly for its light weight, brightness, flood to spot easy slide switch to get it just where you like it. The best feature that I value the most is the variable voltage that you can send to it from the battery pack at the back of the headband. I turn this right down in camp and in tents to save battery life and right up when I am route finding. I keep it about 3/4 for most runs though and it is better than the Petzel’s at that. Also used it in all weather conditions in the hills and am very happy with it. Hi Paul, I have had Petzl headtorches for a long time and found them pretty good, way back from the old Zoom with the luxury of the battery guzzling halogen bulb conversion to the Duo which I found very robust if a little heavy to my current choice of the Myo xp . It is the Myo xp I opted for when I was the equipment officer in my local Mountain Rescue Team and issued them to team members . We have had a couple fail and my own failed when my rucksac came off the “Grabbit” hook with my Myo XP in it, I was being winched down from a Seaking helicopter so no shame to it . Probabaly out of 40 issued we have had 2 fail after a lot of use and abuse . I think you have been unlucky with Petzl however the surefire looks interesting, apart from the price, but it is my birthday next month !! Keep up the good work with the Ask videos . Interesting stuff! I have been a Petzl user for over thiry years and still have a Myo that seems to work OK for me. I’m intrigued by these Surefire Minimus ones though. How long does the battery last on average? Obviously, on full beam, it’ll be flat and dead pretty quickly; however, I’d be interested to hear how long you find it lasts during a period in the woods: prepping food, sourcing firewood, reading and so on. Another headtorch I’ve tried that seems pretty good is made by Princeton Tech: well made, considerably more water resistant than a Petzl and reasonable value. As ever, a great, informative and persuasive article – many thanks! Interesting topic and glad the latest head lamp is lasting well. My current head lamp is a “Cyba-lite” Runs on 1 aa battery and has white and red leds. Quite basic. Battery lasts around 20 hours. Had it for 2 years (thats around 60 to 80 camps for me) So far so good but the elastic is beginning to show signs of wear and tear. I’ve used a petzl tikka for years. The one I use is 17+ years old. It is premodern led/ microchip, it works. Not as well as the current generation of torches/ head lamps maybe but simple and reliable. I would swap it for modern kit but I’m happy with it. Elastic will always deteriorate in sunlight, but I wear mine in the dark! I’m sure what you say is true but my petzl has not let me down ( yet, perhaps it won’t). Battery lfe is poor compared to moden stuff but I carry spare batteries. That’s my experience. There will be a perennial issue over the cost of ( some ) ‘good gear’. Price isn’t always the guide you hope it would be! That applies to just about everything I suppose. From direct personal experience and from that of dealing with hundreds of clients, price is often the wrong measure; cost or value are far better terms, I’ve found. We have clients spending considerable money just to be with us and often a great deal of time and effort has gone into what they feel are key gear choices. Only to have the experience dominated by the £2.99 socks they brought along and the consequent discomfort that over-rode everything else. 8 miles out into the forest/ on the hill, priorities change. Paul included this issue in his opening blog above – gear failure often has a greater impact than the single element involved. I’ve carried a Fenix torch on my belt 24/7 for close to a decade. The brand has served very well. I opted for a newer model only because ‘ I just wanted it’ – its the one with the mode adjustment via a rubber touch switch on the side of the head. It was actually a retrograde step as its hard to find with cold fingers and impossible in gloves – but my bad for being after a new gizmo. As a torch it is great – LD22. Never having Paul’s dribbling problems ( a whole other story 😉 ), I confess to much worse – the realisation mid way through a gralloch that maybe I’d put the torch somewhere unpleasant just prior to the universal mouth mount method! Hence spurred ( in between mouth wash ) to get the Fenix head lamp – dont recall the model – but it has the rear battery pack on the headband. Picked up secondhand off a Forum about 3 years ago. So far faultless – but had far less use than the belt torch. It tends to be an in- car back up light for tracking/ follow-up/ recovery. BUT the control buttons are very hard to access. Seeing Paul’s Surefire was one of those moments of – Oh yeah, thats how a head torch should be made. The rotary control just makes so much sense. But that just underpins what a great resource he offers – nothing dogmatic, just thoughtful insight from experience. I almost bought a Surefire sometime ago, but then I looked at the other products made by the company and I decided that I didn’t want to buy a product from a company that also made high capacity magazines for guns and other similar equipment . I’ve been giving the Surefire Saint complete hell for over 8 years now and it’s never failed me once. They’re bulletproof. 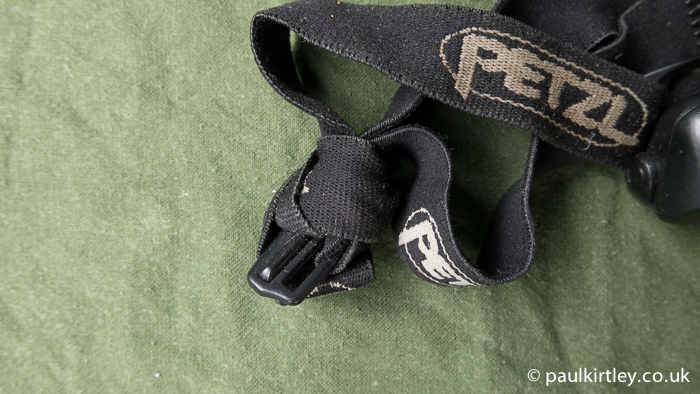 I am using a 10 year old Petzl Tikka XP, it did suffer from the same failure of the elastic head-band that Paul experienced, but I bought a replacement strap online (Petzl original part) for a few pounds earlier this year. I think I have used my XP on around 36 overnight camps a year in recent years and probably around 14 nights a year for the first 7 of those 10 years, so whilst it doesn’t get used as much as Paul uses his it still gets a fair amount of use. I have never experienced any problems with it but have usually used a ‘good’ brand of battery which does make a difference when it comes to leaky batteries I think. I don’t use the torch in extremely cold conditions so don’t need to use lithium batteries. I think Paul has been unlucky with Petzl torches. Having said all that, the Surefire does seem to tick all the boxes if you are in the market for a top end head torch. I have never really liked Petals, for similar reasons to yourself in terms of long term use, material quality and little design annoyances I have had with them over the years. For the past two years I have had the Black diamond storm which so far has served me well. My only glitch with it is that the button on top of the headlight is hard to automatically find when you are wearing gloves. I think that sometimes things are over designed and unnecessarily updated design wise as people seem to have an obsession with having the ‘latest model’ and are guaranteed to make new purchases. easy to adjust between helmet and head! 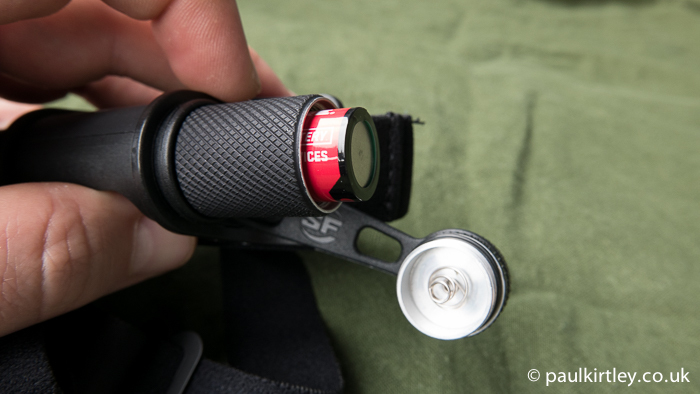 I’ve been using a couple of Alpkit lights but does one exist that does all this? I like you have tried different head lamps over the years and have found most of them lacking durability and or performance. In Petzl’s defence though I’ve been using there Pixa 3 and Pixa 3R for quite a few years now and have found them pretty good bit of kit. They are designed as an industrial lighting solution and are a little heavy but give good flexibility in lighting for both short distance working and long distance spotting. I’ve been using these lamps for work, fishing and camping so they’ve been covered in salt water, chemical’s and all sorts. They’ve had some rough treatment and there still going strong. I tend to favour the Pixa 3R for my outdoor kit due to fact that its rechargeable and I always have some sort of charging equipment with me. I back this up with a small but high powered Led Lenser hand held torch and this setup seems to work for me. This an interesting article and something I’ve been thinking about recently. For a weeks trip into karajok and Ravnastua, Norway back in January this year I bought a new head torch because I couldn’t find my old LED Lensor head torch which I loved for its variable power and flood to spot beam. I decided to splash out and get the top end petzl tikka RXP with red light option for working out in the darkness, (my missing lenser light didn’t have a red light option), and rechargeable battery. when it arrived I liked it and to be fair it did its job very well but there was a few niggles, – hind sight is a wonderful thing. my single biggest problem are the buttons. in gloves the small buttons simply disappear and at -28C to -40C anytime you spend without gloves is not only agony wastes valuable energy warming back up. also the rechargeable battery unit did an amazing job in some outrageously cold weather but I was always aware that I didn’t have a spare and it might fail at any moment. thirdly its a plastic body and as you note it feels like the hinge and anchor points are weak points. all of this are made up by the intelligent lighting mode, or full power making night seem like day light, but Petzl if you read this fix those buttons. should I lose this or break it, an LED Lenser will cost me £25 or the surefire which looks bomb proof and worthy of consideration but four times the price. Thanks for your comments. They make interesting reading. I completely agree that the buttons are a major issue in cold conditions. Even with good quality, relatively dextrous finger-gloves, I would more often than not fumble the Petzl buttons. With mittens, they are just impossible. Thanks for reading and for sharing your experiences. You need to look after your kit better. My Petzl has lasted over 9 years. 9 years in your kit drawer? No, 9 years mainly in the Antarctic. To lose so many Petzl’s in the way you have is very strange; you clearly need to learn to pack your kit better. Petzl are a great brand, nothing wrong with them. In a kit draw in Antarctica! Thanks for adding some context to your original statement. You may well be right. Maybe I do need to learn to pack my kit better. But until I do, Petzl headlamps are clearly too fragile for me and any one else as ham fisted as I am. I’m not sure how packing my kit better would prevent the elastic going or a battery box from shorting out but I’m always willing to learn from my mistakes. Could you perhaps shed a bit more light and let us know which model of Petzl has provided 9 years of sterling service to you? Also, is there any particular reason you are using an anonymous proxy server from which to post your comments? LOL ! Well spotted Paul. Good one! I agree with Ken, Petzl are a solid brand and I have only ever owned one in the last five years. Paul must be a bit heavy-handed LOL. Paul. I do agree that sometimes a plastic headlamp can get cracked in a rucksack. Have you considered those made of AL? Brands like Nitecore, Zebralight, Fenix and others come to mind. I have a EA8 Caveman, two smaller hand torches, a HC90 headlamp, from Nitecore. And two tiny “L” torches from Zebralight. Also have you considered using 18650 batteries? One is equivalent to about 4 to 6 AA batteries. And they work well in low temps. I also have a Black Diamond Icon Polar which runs 4 X AA batteries. I have an old Petzl Duo from years ago with old bulbs it worked fine until I forgot ot remove the batteries when storing it for a while and the battery box has a badly corroded contact, which makes it temperamental as the contact tarnishes. My fault rather then Petzls, but the battery pack which sits on the back of my head is very difficult to maintain. couldn’t kill it. when I bought the LED Lenser I felt it had brittle points, specifically around the hinge, but it lasted a good three years until I lost it. very good light with a power slider on the batter pack and a slider on the light until from flood to search light beam. I bought on line having read a lot of reviews, and initially I liked it. To be honest I still do like it, it gives of a fantastic amount of light and the burn time is good too. 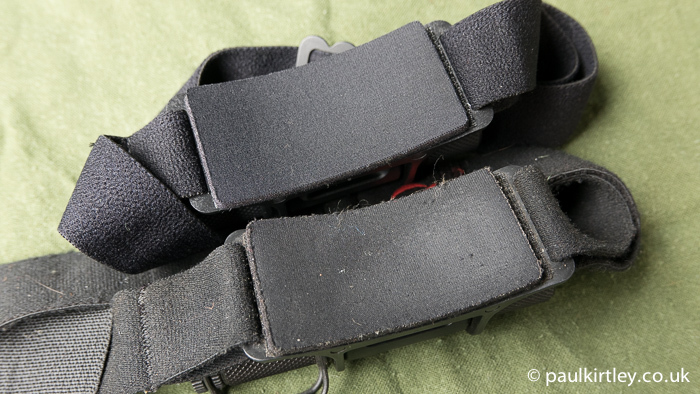 But I’m conscious of the plastic hinge is a weak point in the design, as are the strap loops. especially when working in very cold climates plastic has the potential of being that much more brittle. I feel it doesn’t look robust, but then its done two weeks in the arctic and almost a years abuse without mishap so I might just be worried about nothing. While I’m at it, the strap is rather small too. I haven’t got a big head but, there is not a lot spare strap and rather snug when over a hat. I wonder how people with a bigger head then me would fair. My biggest niggle though on the RXP flagship of the tikka range has to be two small flush buttons. They simply disappear when wearing gloves. I have used my Petzel Tikka EP since 2007. I have many others. The headband was replaceed for $10. I use it often, have camped over 1,000 nights with it. AAA betteries are everywhere, unlike C123. It is powerful enough for night hiking. The green battery indicator LED is a super feature. It is my go-to light here in the darkness of Maine right now. Great article and very objective! Just ordered mine for our great northern Quebec, Canada! Thanks Paul! Hot on the heels of my earlier contribution to the discussion – and being something of a headtorch tart – I went and bought one of these Surefire Minimus beasts. It arrived and I have used it every evening for the late night outing with my dogs. I like the dimming facility on the torch and the fact that it is very easy to direct the beam at a suitable angle. However, the battery life is not that good. I don’t have the torch on full beam when walking the dogs but already, it is flashing at me to let me know that it’s about to run out of juice. Now, on an extended trip to the wilds, this could prove to be rather annoying, particularly if your little, and admittedly lightweight, stock of batteries begins to dwindle and the nights are drawing in. I still like it, though. It is beautifully engineered, flexible in use and comfortable to wear. I’ll just have to carry a few spare batteries with me. I have a Tikka plus(with 2 lamps) over ten years of frequent summer and winter bushcraft and night sea fishing , and to be honest it served me very well. No problem at all if not the head elastic now getting loose but for on 10 years it is right. Maybe just the alcaline batteries do not last longer as I woud and soon or later I will replace the Tikka with another head torch with litium batteries but this time I’m loving Surefire brand, just to try it. I have the samen problem with mij Petzl Tikka. Functioned OK for appr. 1 year in never heavy conditions and after that went on and off very unreliable. Seemed a loose contact but could never localise it. Functioning a couple of weeks OK and many times ( when you needed it in pitch dark….) gave up without obvious reason while shine again happily in beaming sunlight the next day. And so on. I threw the bloody thing away this week when I checked it for a trip and it failed again. By the way: when you open the thing its looking quite lousy and cheap, in no way protecting for sand or moist. Hi Paul, just wantet to know you that a Shop in my Location says that they are coming on the Market again Jan. This year, just wantet you to be updated about that. I’m writing this for the second time as my internet connection failed as I hit submfit everything seemed to disappear, so feel free to delete one (or both if it’s that rubbish). I’ve had three Petzl’s now, two issued in the RAF for aircraft servicing and a Tikka XP. The two I was issued were the original type with the battery pack on the back (could be difficult to find batteries unless you got the AA adapter, which I did) and the POW camp search light type lamp (the comparison ends there as the light just about made it through the lens and stopped), I don’t rate them at all, they’re heavy, bulky, the brightness, as stated, was a joke and we were forever having to repair the wire, usually where it went into the battery pack. The Tikka XP on the other hand has done me good service for five years, like yourself I try to look after my kit (look after your kit and your kit will look after you) but it does get a certain amount of bouncing around and rough treatment and it hasn’t let me down yet. I originally replaced the strap with a Nite-Ize head band so I could also use my Maglite, which I always carry just in case but eventually put the original strap back on as the elastics went floppy and I’d only felt the need to use my Maglite a couple of times though I’ve since put elastic loops on the replacement. All that said your point is well made, I don’t spend nearly as much time outdoors as you do and in your position would definitely look at something like the Sure Fire were I to have had the failure rate you have, I’m a great believer in spending a bit more to get good kit but I looked at your link to amazon and thought f^$” me bandy when I saw the price tag, though I would definitely consider it if were to lose confidence in my Petl or for a long exped. Many thanks for the chance to reply and (hopefully) contribute. I had a similar experience with a Petzl headlamp, tikkina 2 model which was brought me from Germany by a great friend. When I came back, I tried switching batteries once more and it worked, but I noticed it got pretty hot (I MEAN PRETTY HOT) and the batteries went dead eventhough the headlamp was turned off. I mailed Petzl. com and described the situation above and they told me to contact my local Petzl representative (which is spelaion.com.br) which asked me to send the problematic headlamp which was frying batteries to them. I replied something like: “Wait a minute? Isn’t this headlamp rainproof? Isn’t it supposed to be used for climbing? How come a scratch in the screen cause it to fry the batteries? The guy tried to make me understand that it was something with the technical support guys, and that he was just kinda forwarding the info… BUT, he said, WE CAN SELL YOU A BRAND NEW LAMP with discount!!!! I could not believe this was happening and tried to still remain calm, tell him about the situation going on, ask the guy if he realy knew that mountaineering is something serious, and that we don’t take our children toys as lamps to the mountains, that sometimes a lamp can mean a big difference to avoid a big accident and so on…. and ended up saying that by any means I would like to use their brand lamps, as he was telling me they cannot support any drop of water, or simply touching something (as a key in the same pocket) that may eventually scratch the screen. I kindly asked them to send me back the sh*tty non-working headlamp and I am planning to make some video review of how poor this product is. I would like to write to you about bad experience with my latest Petzl Tikka XP lamp. So far I’ve purchased like +10 Petzl Lamps. I always favored Petzl because of good quality. They looked and performed great. After some time I would gave em as gift to my family and friends because they liked em too. I never had any problems with either lamps or their housing material. First crack “magically” developed 3 months after purchase. Unfortunately, because of moving from condo to condo, I lost purchase receipt, otherwise I would returned it. from lamp because I was trying to look for something behind wardrobe while having it on my head. So lamp is now approx 1.5 yrs old and it’s full of cracks. It looks like some 3yr old kid was banging walls with it. Head strap is detached from Lamp because of cleaning. It still works, but it’s close to breaking apart because cracks are appearing everywhere. – I NEVER dropped it on the floor, or sat on backpack while lamp was in. – I look after my gear! Whoever picked production factory or plastic material for this lamp made huge mistake. Plastic is beyond BAD. Also Lamp angle lock system is so flimsy that lamp and light wobbles while regular walking. It drops to lowest angle position if jumped while wearing it. I always liked Petzl lamps but this one is probably the last one I’ve ever purchased. Your lamps are relatively highly priced and I expect equal quality for it, not some Z-class stuff made with cheapo materials. I do hope that you will consider this mail as friendly advice: – Do not loose your customers because of bad decisions. 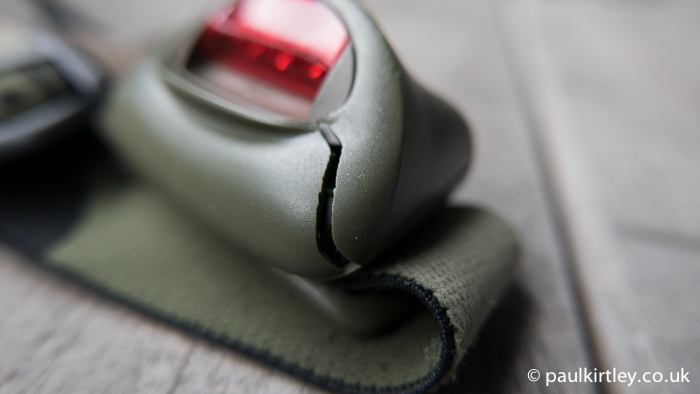 Great brands like Petzl should choose only good quality materials for their products. As hrvoje above I have had the old Tikka XP for about 10 years, it’s been great. I lost it though, so replaced it with the new Style Tikka XP. Bad mistake so it now appears, the new style one is no longer waterproof, there is no sealing whatsoever. The new one is now about 15 months old & have just noticed the plastic case is full of cracks, also as above, the angle adjustment is too loose to be effective. Will I buy another, not unless the quality returns to what it used to be. They are aware of problems with bad materials used in 2015 batch, and my replacement is on the way. So take a photos of your Tikka, write short explanation and sent it to: info at petzl.com and info.france at petzl.com. I’ve sent it to both. Hopefully you’ll get your replacement as well. I’m waiting for replacement to arrive. If it arrives as promised I’ll post it here. Kudos to their customer service. Just to confirm that I’ve received my replacement Tikka XP unit. Petzl acknowledged problems with plastic with some batches from 2015 and they are replacing em based on photo evidence. Kudos to Petzl after sales department! Hi Hrvoje, thanks for keeping us updated on how Petzl are dealing with these issues. My Petzl Tikka 2 headlamp has survived a wash in the washing machine and it still works fine! I like the Surefire Minimus, though much to expensive for me. Interesting article. I have owned three Petzl MYO headlamps, and just recently bought my third (the 370 lumen one) after I lost the second one on a recent trip. I have not had the same strap issues as described above, but I have had serious issues with the piece of crap plastic clip that joins the over-the-head strap to the unit. 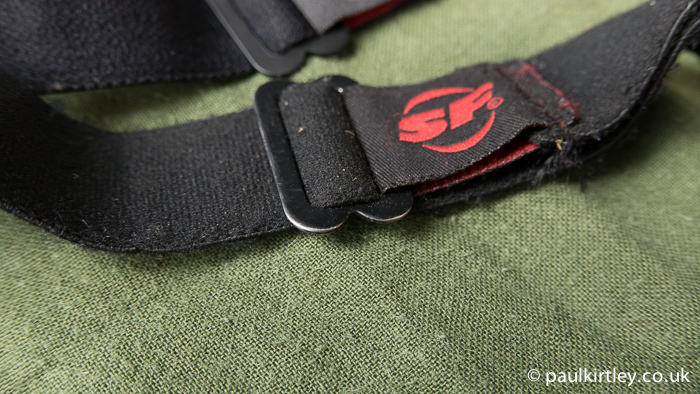 They are relatively inflexible, and no matter how careful I am, I always seem to damage at least one the clips and end up having to thread some fishing line or nylon cord through to fasten the strap to the unit. The headlamp has given me superb service in really harsh conditions, but this cheap plastic ring is beyond belief and I have vowed never to own another Petzl that has this fastener. I don’t know why everyone is still concerned about Petzl. If the product is not serving your needs there are other brands out there that have different concepts altogether. Some have done away with plastics and use Aluminium. E.g. Fenix, Nitecore just to name two. I have no worries about it getting crushed in my bag. Moreover AL makes for better heat dissapation. Many of those use 18650 batteries too. And this offers 4 to 6 times the energy value of AA batteries. There are many advantages from newer entrants. Dump Petzl I say. Just my luck- I recently bought my first headlamp, a Petzl Tactikka, based on info in some of your other articles. 🙁 I also got a Petzl e-Lite, based on the same info. Is that still ok, or is there something better? I still really like the e-Lite. Great back-up torch and I carry one in my first aid kit. Since it has a lithium battery, it also works really well in the cold. As for other models, I’ve had less luck. I still recommend people get a Tikka or similar for their first head-torch. I include them on my course kit-lists. BUT for ME, over an extended period, they don’t hack it. They don’t last. Remember though, I spend more nights out per year compared to most people by a factor of 5-10x. People with intensive use cases than me seem to get along fine with the plastic-bodied Petzls. Read through the comments in this thread. You’ll see a variety of experiences and opinions. The other thing about the Tikka family of torches is they are really quite light and should be considered for light weight trips, even if they are not so durable. Had several Petzl torches and will continue to buy them. My very first one, a Petzl Tikka XP from 2009 still works to this day and believe me, it hasn’t been treated kindly. I used it pretty much daily for it’s first two years as I was living and am living off grid. This torch is still getting used today mostly for around home (compost loo visits etc) and light evening duties and never missed a beat. Had a Myo XP, wich worked a treat till it got stolen. Also have one of the old 4Led Petzl torches wich has been used on and off for 5 years (whenever I can’t find any of the better ones) and my partner has a newer Tikka + wich she has had for a good 5 years. No fault there either. Saying a Petzl will probably last a week’s camping sounds is hugely pessimistic. In fact I heard of very little Petzl breakage outside of dropping them high or sitting/standing on them. As a child I had a bullseye torch with the, then, ubiquitous LR12 battery. Much later, while in New York, I bought a solid and impressive Maglite from one of the stores that supplied the police. I then overcame a slight historical prejudice against head torches (I’m not a pot holer) and bought a Cyba-lite. I LOVED the way there was now light wherever I turned to look (easily amused) and having my hands freed up. There were also 3 easily accessed intensities. Battery life was fairly good but I seldom had it with me unless planned in advance. Then tried to find another mini torch to have with me all the time. Two versions of this – would turn on in my pocket and be dead when needed. This week I read your article, dug out the relics of the Cyba-lite and — decided to replace with new. 1. I don’t want AAAs (or C). 2. I prefer not to have 3 batteries as this makes the logistics of buying/recharging more difficult. 3. I do want AA and would prefer to be able to use Eneloop Pros. 4. Curious about CR123 – for power, endurance, storage and performance in cold conditions. I had, years ago, looked at the Zebralight brand but now discovered similar in the Fenix range – the HL50. Given my good experience with the brand I bought the HL50. Good brightness – and dimness. 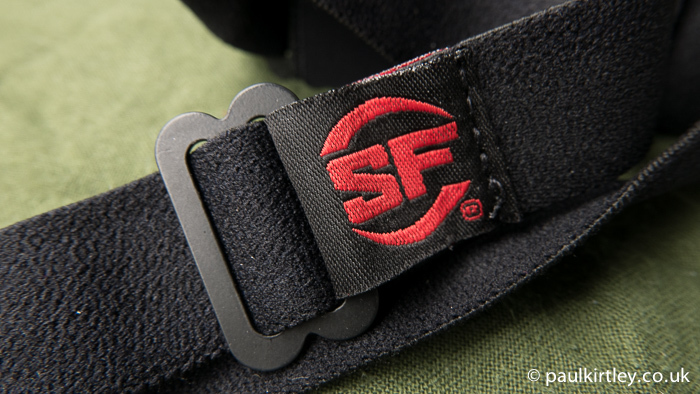 Easy to control, light, simple strap, solidly made. It can be used hand-held and resting on its base. Mine came with a ‘free’ CR123 but I’ll mainly use it with Eneloops. Taking off the AAA adapter gives an extremely compact, light and powerful unit but, for the moment, I’m happier running on rechargeables – partly against the slight risk of accidental operation but mainly because both options are easily available without having to carry the adapter cap separately. I’m sure it’s not ideal for all – possibly for few – but we’re sharing personal experiences and this is fresh in my mind. I still carry the E05 on my keyring as little in my quotidian life requires a head-torch. Great post, and comments. I got a lot out of both. I’m coming from the other side… I love Petzl products. Things break, but overall I really have enjoyed the headlamps from the Petzl Tikka RXP up to the Ultra Rush. I found them when they were making the Tikka RXP and it was novel, but seems you’ve been buying their stuff for years before me. Maybe I missed some of the junk years? My Petzl Tikka RXP I’ve used for over a year. It broke – started giving me some weird battery charging information – and then didn’t charge and then charged, etc. I wrote it off. I had already used it well over 200 times on my field trips for venomous snakes here in Thailand. When I first got the headlamp I didn’t think it was really made to last. The weird battery shape and snapping it in, seemed hokey. Still, while it lasted (9 mths) I was happy because I didn’t expect it to last that long. Now that I see you had a light that went for 5 years without a problem – that’s something! Maybe I’ll adjust my expectations. At the same time I was giving my Tikka to people on the trips to use, I was using the Petzl Nao (2) – the 575 lumens model. It has performed flawlessly for over a year now, and I’ve been quite satisfied with it. Cost was around $170, but now it’s down to $135 as the new Nao + came out and is more expensive. I bought the Nao+ and the Ultra Rush – to see what sort of light they put out. I need a special light for looking for snakes… super white, a nice evenly lit beam with a slightly brighter center, and manual adjustments available on the fly. So, these two lights have been amazing. I think whenever one gets into buying the higher-end products, he can expect more. So now, I certainly expect a lot from these two lights. Many ultra-runners use these lights and yours was the first article I’ve seen expressing displeasure over them. I think you expected a lot early on – I think you’d maybe be happier with one of the Nao models. OK, cheers then – just wanted to give another point of view. If one of my new lamps breaks soon – or both of them, I’ll be writing a negative article too if Petzl’s customer service doesn’t come through! 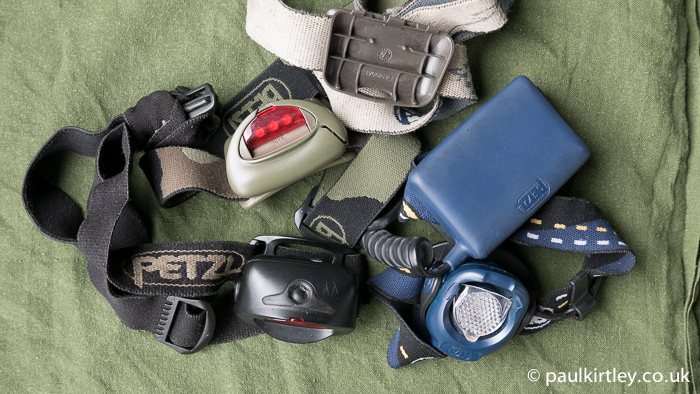 Like you, I’ve used lots of different AAA or AA variants of Petzl’s product line over the years. The latest one I bought, and the one I have had longest, I bought probably about 1.5-2 years ago. I was attracted to it because it’s rechargable (with a lithium pack included) but can also run on AAA. Has a low power mode and can do flood, signal, or directional beam. You can also adjust the direct on the beam vertically (always a bug bear of mine with head torches – why would you sell a tea torch which sits on your head and points too high or too low). 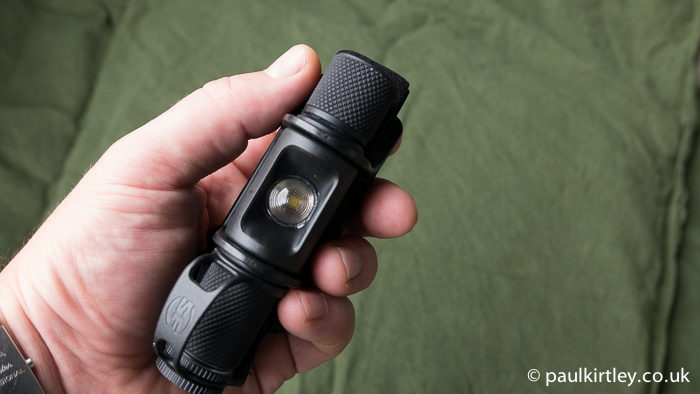 At max 220 lumens it is plenty bright enough for bushcraft and night navigation. It typically lasts about 8 hours as long as you aren’t on full power continually, and while the strap losing it’s elastic properties, I can’t fault the lighting unit. Firstly i haven’t read all the comments so i apologise if someone has already said this: the Myo XP mentioned had a known and common fault with the manufacturers from day one and while it wasn’t enough to offer a full recall, they did quickly get to a point where they were simply swapping any sent back with the updated Myo RXP. I’ve been selling Petzl headtorches in outdoor shops for ten years and have done this many times. The rest of the Petzl range seems significantly more robust. With the exception of one Tikka RXP that i’ve been given that isn’t holding it’s charge – the reason i came across your blog in the first place – i’ve seen very few come back. I have a Petzl Nao at the moment (you might as well with staff discount) and if it needed replacing, that would be my first pick. Their range now gives plenty of cheaper options. I don’t want to push them too much but i have always liked them, i’d say they’re always worth a look. Thanks for your comments, particularly with respect to recent Petzl models. I still recommend Petzl headtorches for people coming out to the woods for a week or two now and again (including students on my courses) but they are not durable enough for me. The Surefire in this article is still going strong. Only sign of wear is the elastic is starting to loose its twang. The metal body is, of course, still fine. I’ve moved on from Petzl. I now use headlamps that run on 18650 batteries like the Nitecore range. Another good range is the Zebralight range. The Zebra lights are extremely lightweight with aircraft aluminium. Love them. You can stamp on them or crush them in your pack and there’ll be no damage. I have had a Tikka XP2 since they first came out that is still going strong after multiple Boreal and other canoe and kayaking trips, trekking in Africa, New Zealand, the US and Canada and daily in my pocket or tool box on the job. It has survived several swims unaffected. It is always with me. Nevertheless I am looking for a new headlamp. Why? Because the regulated light output from my dive lights is so superior. Unfortunately, the dive lights themselves cannot be used above water as they would self destruct from the heat they generate. While an even brighter headlamp would be nice, that is not the feature I am after. Rather it is the constant light output over the life of the batteries. This feature is available in some of the newer headlamp models but I don’t see it being discussed here. I would not consider any new light without it. I would be happy with another Tikka XP2 with this single additional improvement. I have had two Petzyl headlamps; don’t recall which type other than they were the same and had the red drop down filter. Both developed cracks and basically disintegrated, and their headbands lost elasticity, in about a year. I will never go back to Petzyl, and have been using the Black Diamond Storm for about 3 years now. I am thinking I will go for metal body and rechargeable for my next one … perhaps Fenix or Nitecore. I use my headlamp every single day. Hey Steve, thanks for adding your experience to the conversation. Yes, I think rechargeble makes sense if you use every day and can charge every or almost every day. I have a LED Lender H7R. I got it 6 or 7 years ago. It has survived probably 15 fishing trips per year, half a dozen camping trips, 40 or 50 night shifts a year doing event/festival carpentry and for the last 2 years working offshore full time with probably 50-70 nights in all weather’s per year. Couldn’t have asked for better and the batteries are only now not keeping a charge. I use O’lights H1 Nova every day for the last year. The strap got stretched out so I called see where I could get some more and to see if it was warranted. It was not and they showed me where to buy them. I ordered 2 and when my package came they had put 6 more at no charge. I like this light because it uses a CR 123 and I got the rechargeables. It has a special tail cap that works with a magnetic charger. So no taking out the battery. It was about $60 US. Over all I love this light and company. Hi Guy’s, I always find it so interesting reading honest reviews of lighting products. and the comments following this review were just as compelling. I work for a company called Led Lenser and if anyone is interested i’d love to see if we can get some product reviews on our latest ranges. 10) Easy battery change or long battery life and easy recharging. OK it is not the worlds best beam but it is pretty good, excellent in fact for 2010 which was when I bought my first one of these. Flicking the white diffuser over the single LED gives a superb even spread of light for close up work or walking. A flood of light is so much easier on the eyes than the contrast between a bright sharply defined beam surrounded by darkness – and it does’t make your pupils contracts as much either. The single LED has a high setting and a low setting. With the diffuser flicked over it is great for close up work or, on low setting for reading. Red light is much easier on the eyes and more peaceful for night time reading. The low setting plus the red diffuser gives a lovely even spread of red light which is just right for night time reading. This is useful for outdoors if you are with others – doesn’t blind them but still gives adequate illumination. The weight of this torch including 2 x aaa batteries and the head strap is 92 grams and it is so comfortable it is easy to forget you have it on. The centre of gravity is near the head which is where it should be, not a few cm out. 7) Quick and easy to put on. If a head torch is so big and heavy that it needs a top strap or a separate battery pack it does not meet this requirement so well. This has a great strap which lasts for years and is easy to adjust and the torch can be put on or off with one hand – easily and is small enough to fit easily in a pocket. It can be damaged by dropping it, but that would be unusual. This is a very tough torch. If it rains when you are out with this, nothing bad happens. When you get used to this torch it is easy to change the two batteries whilst outside walking in the dark. Two spare aaa batteries are very easy to carry in the pocket. If on high beam, this torch will cut out without warning when batteries get low. That could be bad if you were cycling, however when that happens, you can switch it back on again – to low power – and it will be work for at least an other half hour (using rechargeables – I don’t know about alkaline batteries) In practice this is a superb feature as it means the torch always gives you a warning when batteries are low. There is only one button and it takes two presses to put it off when in full power mode. I can live with that. There are two diffusers – red and clear, which are easy to use. They are part of the torch so don’t get lost. A ridge on the base of the torch engages with a series of ridges on the battery cover so it can be clicked into about 11 different angles. There is nothing to get slack, it never changes angle on its own and the ridges don’t wear out. Superb. This torch can withstand years of daily use but the single push switch can eventually fail. Nothing in this world lasts forever, but this goes further than most. Sadly this was superseded by new models which were inferior and I can’t find this now and I have not found another head torch I like. Any suggestions?